This article is about the animal. For other uses, see Newt (disambiguation). "Eft" redirects here. For other uses, see EFT. A newt is a salamander in the subfamily Pleurodelinae, also called eft during its terrestrial juvenile phase. Unlike other members of the family Salamandridae, newts are semiaquatic, alternating between aquatic and terrestrial habitats over the year, sometimes even staying in the water full-time. Not all aquatic salamanders are considered newts, however. More than 100 known species of newts are found in North America, Europe, North Africa and Asia. Newts metamorphose through three distinct developmental life stages: aquatic larva, terrestrial juvenile (eft), and adult. Adult newts have lizard-like bodies and return to the water every year to breed, otherwise living in humid, cover-rich land habitats. Newts are threatened by habitat loss, fragmentation and pollution. Several species are endangered, and at least one species, the Yunnan lake newt, has gone extinct recently. Pleurodeles, including the Iberian ribbed newt, is the type genus of subfamily Pleurodelinae. The Old English name of the animal was efte, efeta (of unknown origin), resulting in Middle English eft; this word was transformed irregularly into euft, evete, or ewt(e). The initial 'n' was added from the indefinite article 'an' by provection (juncture loss) ("an eft" -> "a n'eft" -> ...) by the early 15th century. The form 'newt' appears to have arisen as a dialectal variant of eft in Staffordshire, but entered Standard English by the Early Modern period (used by Shakespeare in Macbeth iv.1). The regular form eft, now only used for newly metamorphosed specimens, survived alongside newt, especially in composition, the larva being called "water-eft" and the mature form "land-eft" well into the 18th century, but the simplex "eft" as equivalent to "water-eft" has been in use since at least the 17th century. Dialectal English and Scots also has the word ask (also awsk, esk in Scots) used for both newts and wall lizards, from Old English āþexe, from Proto-Germanic *agiþahsijǭ, literally "lizard-badger" or "distaff-like lizard" (compare German Eidechse and Echse, both "lizard"; *agi- is ultimately cognate with Greek ὄφις "snake", from Proto-Indo-European *h₁ogʷʰis). Latin had the name stellio for a type of spotted newt, now used for species of the genus Stellagama. Ancient Greek had the name κορδύλος, presumably for the water newt (immature newt, eft). German has Molch, from Middle High German mol, wikt:olm, like the English term of unknown etymology. Newts are also known as Tritones (viz., named for the mythological Triton) in historical literature, and "triton" remains in use as common name in some Romance languages, in Greek, in Romanian, Russian, and Bulgarian. The systematic name Tritones was introduced alongside Pleurodelinae by Tschudi in 1838, based on the type genus named Triton by Laurenti in 1768. Laurenti's Triton was renamed to Triturus ("Triton-tail") by Rafinesque in 1815. Tschudi's Pleurodelinae is based on the type genus Pleurodeles (ribbed newt) named by Michahelles in 1830 (the name meaning "having prominent ribs", formed from πλευρά "ribs" and δῆλος "conspicuous"). The Pyrenean brook newt lives in small streams in the Pyrenees mountains. Newts are found in North America, Europe, North Africa and Asia. The Pacific newts (Taricha) and the Eastern newts (Notophthalmus) with together seven species are the only representatives in North America, while most diversity is found in the Old World: In Europe and the Middle East, the group's likely origin, eight genera with roughly 30 species are found, with the ribbed newts (Pleurodeles) extending to northernmost Africa. Eastern Asia, from Eastern India over Indochina to Japan, is home to five genera with more than 40 species. Newts are semiaquatic, spending part of the year in the water for reproduction and the rest of the year on land. While most species prefer stagnant water bodies such as ponds, ditches or flooded meadows for reproduction, some species such as the Danube crested newt can also occur in slow-flowing rivers. The European brook newts (Calotriton) and European mountain newts (Euproctus) have even adapted to life in cold, oxygen-rich mountain streams. During their terrestrial phase, newts live in humid habitats with abundant cover such as logs, rocks, or earth holes. Newts share many of the characteristics of their salamander kin, Caudata, including semipermeable glandular skin, four equal-sized limbs, and a distinct tail. The newt's skin, however, is not as smooth as that of other salamanders. Aquatic larvae have true teeth on both upper and lower jaws, and external gills. They have the ability to regenerate limbs, eyes, spinal cords, hearts, intestines, and upper and lower jaws. The Japanese fire belly newt can regenerate its eye lens 18 times over a period of 16 years and retain its structural and functional properties. The cells at the site of the injury have the ability to undifferentiate, reproduce rapidly, and differentiate again to create a new limb or organ. One hypothesis is that the undifferentiated cells are related to tumour cells, since chemicals that produce tumours in other animals will produce additional limbs in newts. The main breeding season for newts (in the Northern Hemisphere) is in June and July. After courtship rituals of varying complexity, which take place in ponds or slow-moving streams, the male newt transfers a spermatophore, which is taken up by the female. Fertilized eggs are laid singly and are usually attached to aquatic plants. This distinguishes them from the free-floating eggs of frogs or toads, which are laid in clumps or in strings. Plant leaves are usually folded over and attached to the eggs to protect them. The larvae, which resemble fish fry but are distinguished by their feathery external gills, hatch out in about three weeks. After hatching, they eat algae, small invertebrates, or other amphibian larvae. During the subsequent few months, the larvae undergo metamorphosis, during which they develop legs, and the gills are absorbed and replaced by air-breathing lungs. Some species, such as the North American newts, also become more brightly coloured during this phase. Once fully metamorphosised, they leave the water and live a terrestrial life, when they are known as "efts". Only when the eft reaches adulthood will the North American species return to live in water, rarely venturing back onto the land. Conversely, most European species live their adult lives on land and only visit water to breed. Newts lay their eggs on structures such as plants or stones under water. The larvae first develop fore- and later hindlimbs, and are strictly carnivorous. After metamorphosis, terrestrial juveniles also known as efts. The Pacific newts (Taricha), including the California newt, are known for their toxicity. Many newts produce toxins in their skin secretions as a defence mechanism against predators. Taricha newts of western North America are particularly toxic. The rough-skinned newt Taricha granulosa of the Pacific Northwest produces more than enough tetrodotoxin to kill an adult human, and some Native Americans of the Pacific Northwest used the toxin to poison their enemies. However, the toxins are only dangerous if ingested, and the newts can easily and safely live in the same ponds or streams as frogs and other amphibians, or be safely kept as pets. The only predators of Taricha newts are garter snakes, some having developed a resistance to the toxin. Most newts can be safely handled, provided the toxins they produce are not ingested or allowed to come in contact with mucous membranes or breaks in the skin. After handling, proper hand-washing techniques should be followed due to the risk from the toxins they produce and bacteria they carry, such as Salmonella. It is, however, illegal to handle or disturb great crested newts in the UK without a licence. Hypselotriton, Laotriton and Liangshantriton are regarded as separate genera by some authors, but this is not unanimous. The term "newt" has traditionally been seen as an exclusively functional term for salamanders living in water, and not a clade. Phylogenetic analyses have however shown that species in the Salamandridae traditionally called newts do form a monophyletic group. Other, more distantly related salamander families also contain fully or in part aquatic species, such as the mole salamanders, the Proteidae, or the Sirenidae. The Yunnan lake newt is considered extinct. Although some species, such as the rough-skinned newt (Taricha granulosa) in North America or the smooth newt (Lissotriton vulgaris) in Europe, are still relatively common, populations of newts throughout their distribution range suffer from habitat loss, fragmentation, and pollution. This affects especially the aquatic breeding sites they depend on, but also their land habitats. Several species, such as the Edough ribbed newt (Pleurodeles poireti), Kaiser's spotted newt (Neurergus kaiseri), or the Montseny brook newt (Calotriton arnoldi) are considerered threatened by the IUCN, and the Yunnan lake newt is a tragic example of a newt species that has gone extinct recently. Some newt populations in Europe have decreased because of pollution or destruction of their breeding sites and terrestrial habitats, and countries such as the UK have taken steps to halt their declines. In the UK, they are protected under the Wildlife and Countryside Act 1981 and the Habitat Regulations Act 1994. It is illegal to catch, possess, or handle great crested newts without a licence, or to cause them harm or death, or to disturb their habitat in any way. 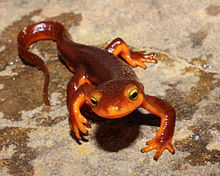 The IUCN Red List categorises the species as ‘lower risk’ Although the other UK species, the smooth newt and palmate newt are not listed, the sale of either species is prohibited under the Wildlife and Countryside Act, 1981. The remaining European species are listed as "protected fauna species" under appendix III. Newts, as with salamanders in general and other amphibians, serve as bioindicators because of their thin, sensitive skin and evidence of their presence (or absence) can serve as an indicator of the health of the environment. Most species are highly sensitive to subtle changes in the pH level of the streams and lakes where they live. Because their skin is permeable to water, they absorb oxygen and other substances they need through their skin. Scientists study the stability of the amphibian population when studying the water quality of a particular body of water. Chinese warty newts, Chinese fire belly newts, eastern newts, paddletail newts, Japanese fire belly newts, Chuxiong fire-bellied newts, Triturus species, emperor newts, Spanish ribbed newts (leucistic genes exist), and red-tailed knobby newts are some commonly seen newts in the pet trade. Some newts rarely seen in the pet trade are rough-skinned newts, Kaiser's spotted newts, banded newts and yellow-spotted newts. ^ a b c Zhang, Peng; Papenfuss, Theodore J.; Wake, Marvalee H.; Qu, Lianghu; Wake, David B. (2008). "Phylogeny and biogeography of the family Salamandridae (Amphibia: Caudata) inferred from complete mitochondrial genomes" (PDF). Molecular Phylogenetics and Evolution. 49 (2): 586–597. doi:10.1016/j.ympev.2008.08.020. ISSN 1055-7903. PMID 18801447. Archived from the original (PDF) on 2017-02-02. Retrieved 2016-08-29. ^ Oxford English Dictionary; Anon. "Online etymological dictionary". Douglas Harper. Retrieved 9 October 2013. ^ The Gentleman's Magazine, and Historical Chronicle, Volume 47 (1777), p. 321. ^ John Wilkins, An Essay Towards a Real Character, and a Philosophical Language (1668), p. 161. "the water-eft, or newt, is only the larva of the land-eft, as tadpoles are of frogs." Gilbert White, The Natural History and Antiquities of Selborne, in the County of Southampton (1789) p. 50. "the salamandra aquatica of Hay, (the water-newt, or eft,)" Archibald Constable, Constable's miscellany of original and selected publications in the various departments of literature, science, & the arts, Volume 45 (1829), p. 63. ^ Wolfgang Pfeifer (ed. ), Etymologisches Wörterbuch des Deutschen. Deutscher Taschenbuch Verlag, Munich 1997 (revised edition of Akademie Verlag, Munich 1989 and 1993), p. 265, s.v. Eidechse. Pfeifer gives the second element as germ. *þahsjō(n), relating it to Middle High German dehse "distaff", so that both animals (lizard and badger) were parallelized due to their common, spindle-shaped bodies. ^ Alain Dubois and Roger Bour, The nomenclatural status of the nomina of amphibians and reptiles created by Garsault (1764), with a parsimonious solution to an old nomenclatural problem regarding the genus Bufo (Amphibia, Anura), comments on the taxonomy of this genus, and comments on some nomina created by Laurenti (1768), Zootaxa 2447 (2010), 1–52. ^ Collins, J. T.; Conant, R.; Stebbins, R. C.; Peterson, R. T. (1999). Peterson First Guide to Reptiles and Amphibians. Houghton Mifflin Harcourt. ISBN 978-0-395-97195-6. ^ Heying, Heather. "Adw: Caudata: Information". Animaldiversity.ummz.umich.edu. Retrieved 2013-06-06. ^ "Newts re-grow eye lens 18 times over". COSMOS magazine. 2011-07-13. Archived from the original on 2012-04-24. Retrieved 2013-06-06. ^ "Amphibians - body, used, water, process, Earth, life, characteristics, form, animals, oxygen, air, plant, change, History, Characteristics, Life cycle, Three major groupings". Scienceclarified.com. 2009-10-13. Retrieved 2013-06-06. ^ "Cambridge City Council: Local Nature Reserves". Lnr.cambridge.gov.uk. 2005-07-25. Archived from the original on 2013-07-23. Retrieved 2013-06-06. ^ Brockes, J; Kumar, A (Jan 2005). "Newts". Current Biology. 15 (2): R42–R44. doi:10.1016/j.cub.2004.12.049. PMID 15668151. Retrieved 2013-06-06. ^ a b "BBC Nature - Great crested newt videos, news and facts". Bbc.co.uk. Retrieved 2013-06-06. ^ a b "Caudata Culture Articles - Newt Toxins". Caudata.org. Retrieved 2013-06-06. ^ "CDC MMWR: Reptile-Associated Salmonellosis: Selected States, 1998-2002". Cdc.gov. 2003-12-12. Retrieved 2013-06-06. ^ a b "Science & Nature - Wildfacts - Smooth newt, common newt". BBC. 2012-04-27. Retrieved 2013-06-06. ^ a b Pyron, R.A.; Weins, J.J. (2011). "A large-scale phylogeny of Amphibia including over 2800 species, and a revised classification of advanced frogs, salamanders, and caecilians" (PDF). Molecular Phylogenetics and Evolution. 61 (2): 543–853. doi:10.1016/j.ympev.2011.06.012. PMID 21723399. ^ a b c Frost, D.R. (2016). "Pleurodelinae. Amphibian Species of the World: an Online Reference. Version 6.0". New York: American Museum of Natural History. Retrieved 2016-08-27. ^ Marjanović, David; Witzmann, Florian (2015). "An Extremely Peramorphic Newt (Urodela: Salamandridae: Pleurodelini) from the Latest Oligocene of Germany, and a New Phylogenetic Analysis of Extant and Extinct Salamandrids". PLOS ONE. 10 (9): e0137068. doi:10.1371/journal.pone.0137068. ISSN 1932-6203. PMC 4589347. PMID 26421432. ^ Yang Datong; Michael Wai Neng Lau (2004). "Hypselotriton wolterstorffi". The IUCN Red List of Threatened Species. IUCN. 2004: e.T59445A11942589. doi:10.2305/IUCN.UK.2004.RLTS.T59445A11942589.en. Retrieved 15 January 2018. ^ "USGS Amphibian Research Monitoring Initiative (Pacific Northwest Region)". Fresc.usgs.gov. 2013-01-30. Retrieved 2013-06-06. ^ "Smooth newt videos, photos and facts - Triturus vulgaris". ARKive. Archived from the original on 2008-12-01. Retrieved 2013-06-06. ^ "Annexe II: Strictly protected fauna species". Retrieved 2013-06-06. ^ "Annexe III: Protected fauna species". Retrieved 2013-06-06. Look up newt in Wiktionary, the free dictionary. Look up newt or eft in Wiktionary, the free dictionary. This page was last edited on 16 April 2019, at 21:55 (UTC).